First comes love, then comes marriage, then comes….honeymoon? Or even better yet, a free honeymoon? If you’re getting married soon, then it goes without saying that you need to fill out a registry. (I’ll admit, I was looking as forward to starting my registry after getting engaged as I was about the marriage itself!). And right now you can enter the Macy’s Wedding Registry Happy Honeymoon Sweepstakes if you have a registry with Macy’s. Macy’s was the first place my (now) husband and I registered because it has EVERYTHING a new couple needs, from bedding and dinnerware to beach towels and baby outfits. I walked around the store with that scan gun for hours, picking out everything we could possibly want or need for our new life together. To this day, I still vividly remember deciding on our Calvin Klein duvet cover and trying to figure out whether we wanted bath towels or bath sheets (we ended up with some of both!). Plus, the folks at Macy’s were so helpful in walking us through the process, as well as offering guidance along the way when we had questions. Whether we needed to update our address list or didn’t know how many table settings to purchase, the Macy’s team always had an answer. 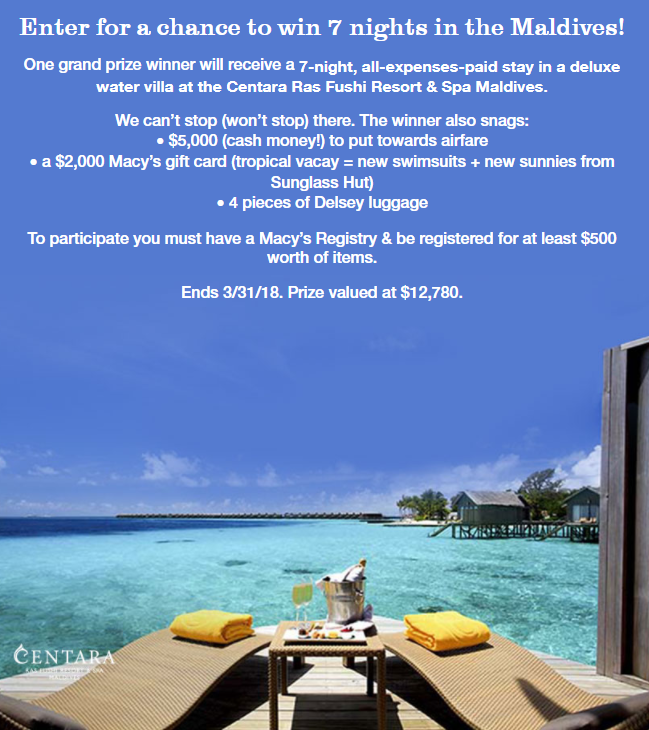 But now I wish I could register all over again because if you create a registry at Macy’s, you can also enter for a chance to win a 7-night, all expenses paid stay in a deluxe water villa at the Centara Ras Fushi Resort & Spa Maldives. This incredible trip is valued at over $12,000! And all you have to do to participate is to have a Macy’s Registry and be registered for at least $500 worth of items (which isn’t hard to do when you’re outfitting a new home – I co do that on small kitchen appliances alone!). So what are you waiting for? Paradise awaits…but only until March 21, 2018, which is when you need to enter by. Good luck…I wish you could take me with you! NO PURCHASE NECESSARY. Open to legal residents of the fifty (50) United States, D.C., Puerto Rico and Guam 18 years and older with a Qualifying Registry at Macy’s. Ends 3/31/18. For Official Rules, alternate method of entry, and complete details, click here. Void where prohibited.